Let me preface this moment by saying that I’ve now officially been a stay at home mom for 3 years and although I feel extremely blessed to have this wonderful life God has provided for me, I still continue to feel guilty…a lot! I’m not quite sure how it really started or even when, but there are things that don’t mean a lot in this lifetime, and I still feel guilty about them. And the worst part was that this guilt was due to me wanting to spend time with my husband, kids or do something for myself. What a joke, right? I often find myself thinking about what else I should be doing other than sitting and reading a good book while my kids nap, just sitting and watching a show with the kids because that’s all they wanted at that very moment or even while lounging on the couch watching a football game with my husband. I shouldn’t feel this way nor should I act on those feelings. It is important to have time for myself to recharge and it’s even way more important for me to enjoy some simple minded television watching while cuddling with my spouse. Yet those little things that bring so much joy, are usually just a thought in the back of my mind because there are dishes to be done, or other household meaningless tasks. 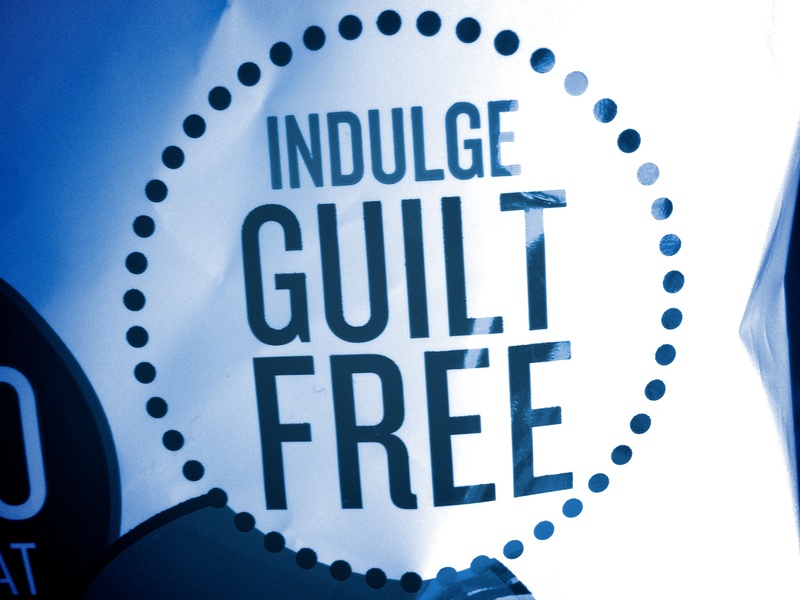 Now it wasn’t until I had my oldest son home from school for Christmas break when that little phrase “Indulge Guilt Free” from Skinny Pop actually triggered something for me. The first official day of Christmas break I spent time with all three of my children together…building forts, playing games, coloring and eating snacks all day. It was pure JOY! The next day was Christmas Eve and I had SO much to do. I felt guilty having “wasted” the whole day before getting nothing prepared for our Christmas. Why in the world should I feel guilty about that? Not sure, but it happened. A few days after Christmas, my oldest and I were laying on the living room floor with a bucket of Lego’s enjoying what he calls “Mommy time”. We had our snack of popcorn and possibly some dark chocolate, and we were building away. This was relaxing, good quality time with my boy who was now in school more than with me. I sat there feeling a bit fidgety as I always do anticipating what I would “get done” next as soon as we were done building. 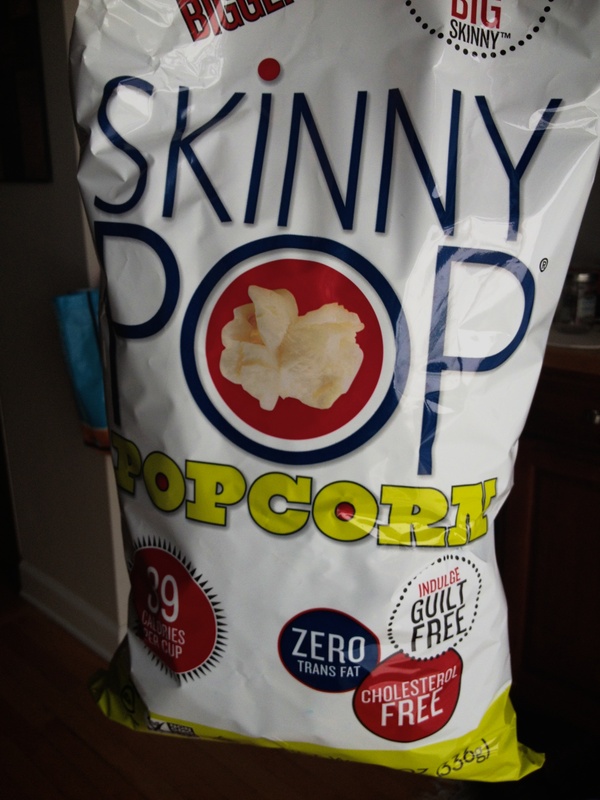 Then as I took another bite of my popcorn, it slapped me in the face, the big Skinny Pop phrase “Indulge, guilt free”. Why am I not FULLY enjoying this simple pleasure of quality time with my son? It was then that I was set “guilt free”. We moved on from Lego’s, to reading books, and downloading a new game on the iPad that has become a competition between the two of us as to who can get a higher score. Since then I sit down often with no qualms, and enjoy these precious moments with my family. It was a simple thought then but things really have changed for me over the last couple of weeks. Guilt just isn’t healthy…it isn’t good for me to live with and it’s not good for me to always be somewhere else and not fully present with my family. Adios to you my guilt…please do not resurface again when things change as they always do. Ferberizing, coffee, and a puzzle game! 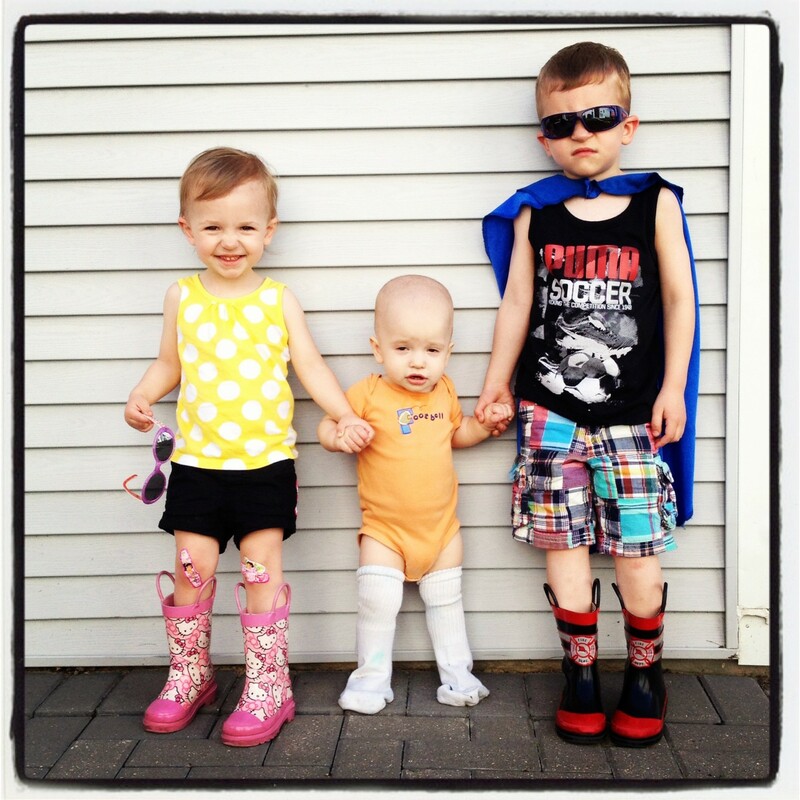 There is so much to discuss in this blog because it’s been a crazy few weeks. Long story in short, a couple of weeks ago my adorable 4 1/2 month old who has slept beautifully since day one, started not sleeping. He would go to sleep fine but would wake up just an hour or two after bed and then wake up numerous times in the night. All the questions started: Am I producing enough milk? Is he getting enough to eat? Does he have an ear infection? Is he having a growth spurt? What could it be? After a process of elimination…my husband and I have decided he just liked to hang out with his Mommy at night. Well, when you have 3 kids, all of which demand a lot of attention, being up at night doesn’t lead to a quality next day. After contemplating many ways to solve this problem, and speaking to our pediatrician, we decided to follow The Ferber Method and sleep train Garrett. This is also known as the “cry it out” method, one many are not fond of, however, it worked for us with Parker so we thought we’d give it a try. With this method you go into the baby’s room, sing/talk softly, rub their belly or in our case, pat their back (this is because our little boy decided his tummy was where he’d be sleeping at 3 1/2 months when he started rolling over) and you do this in timed increments (ex: 2min, 5min, 7min, etc.). Night one was a nightmare as we did the above method for 3 1/2 hours…he cried and cried, heart breaking, but I knew I had to be consistent as he was very stubborn. Because he is so small and likes to sleep on his tummy, I kept going into his room at the 15min mark to encourage him he was okay. He’d calm down for a little bit and start crying again. Night two was a bit better with only a couple wakings and the longest stretch of crying being 41 minutes. Night three was even better with only waking once in the night lasting 14 minutes! Phew! We made it! It wasn’t easy but it worked! Garrett has continuously slept through the night since with only a few early mornings which I can handle if I’ve had 6+ straight hours of sleep AND coffee. Yes, coffee! This may sound strange but I cannot tell you how happy I was to brew that first cup of coffee during those few groggy mornings. Even though I was tired, I could look forward to a simple kick start before my other two kids woke up! I became very close to my Keurig that week and continue to have a special bond with my morning coffee! During my very tired days, I still managed to have quality time with my older kids. The puzzles we own have become boring to my 4 year old because he’s now memorized where all the pieces go so we decided to create a puzzle game. It’s a lot like ‘go fish’. We turn all the pieces over except for the four corners. We leave the corners face up. 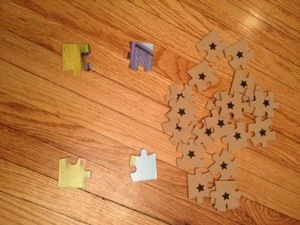 We each draw one puzzle piece without seeing the front and see if we can make it fit. If we can, then we go again. If it doesn’t fit, we turn it back over and put back in the pile. This taught my kids to look for the straight side of a piece in order to build the border of a puzzle first. This turned a quick puzzle into a 15-20 minute game time for us to hang out quietly and give mommy a break from playing superheros and watching the kids jump off of stools onto their bean bags. The reason I blog about this all of this is because in today’s world, everyone has an opinion, especially in the “mom world” and I heard lots of these opinions all during a difficult, sleep deprived time for me, which made me wonder, am I doing the right thing? Fortunately for me, I have a very supportive husband who encouraged me to do what I felt was right. As a Mom there are MANY times we wonder if we are doing right by our children and all we can do is follow our hearts, be confident in our ability to care for our children and pray to God and ask that He be present in this journey! Trying to keep things in perspective! So, today, I’m struggling as a Mom. I’m tired. We had a great weekend away. Traveling with the kids went so smoothly and I couldn’t have been more proud of their behavior on the flights. Now, how they acted at certain times during our trip is a different story, but for this blog, I’m focusing on today. If there is one thing that I’ve learned today, it’s that nothing is as bad as it seems. However, in the moment, it can seem awful! Let’s start with an example of how extreme things are around here and why I can’t feel like I have a grasp on anything. While getting my son ready for school this morning, I asked him to go to the bathroom, put on his clothes, and get ready to brush his teeth, all of which I received an “ok, mom, no problem.” Immediately following those steps, he says “Mom, I’ll go get my shoes on for you.” My husband chimes in “Who is this kid?” After the last few power struggles with him, I was beginning to think we were losing control of his behavior. Parker then tells me “I’m going to have good behavior for you today.” Phew! I get a chance to have a normal day! Wrong! I pick him up from school and head to the grocery store with all 3 kids, which usually goes okay for me. Well, without all the details, we had LOTS of crying, and ‘a talking to’ in the bathroom, and more crying…we couldn’t get things together. I say “we” because I’m referring to me too…when a Mom is tried, it is really hard to handle these public situations the best way you’d like to…but for that moment, it was my best. About half way through the grocery store, my kids start talking again, laughing at their silliness as if nothing just happened back there in isles 1-5. Really, kids? Just like that, it’s no big deal? Well, not for me…I’m still mad and disappointed in everyone, including myself. I get in my nice warm van, kids are happy with the DVD player on and as I head out of the parking lot I see a car smashed into the metal gate of the lot, which was knocked over onto about 3 more cars and people in shock all around. I have no idea what happened, but I started to put things into perspective…I am very thankful for the disruption my kids caused while shopping, it slowed us down about 10 minutes and kept us from being involved in that accident. I always have K-Love on in the car, and they were talking about disaster relief…wow, another slap in the face…keep things in perspective, Tracy! It was time to stop wallowing in my self pity and remember those who are really suffering. I prayed all the way home for those dealing with the storms in the east, families who struggle with making ends meet, people who are dealing with health issues and for God to forgive me for my lack of patience with my children. Then, I get home, put groceries away, make lunch, get my two oldest kids down for a nap and attempt to get my 3rd down and the nightmare begins again…he cries, and cries…I remember how this all started today…I’m tired! 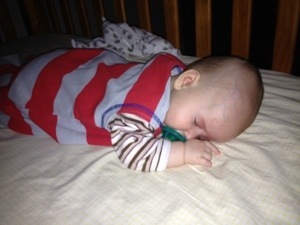 I haven’t had much sleep lately due to my 4 month old’s lack of sleep schedule. I thought maybe, just maybe, if all 3 could sleep at once, I could catch up a bit…you know that saying “sleep when your baby sleeps?”, my baby needs to sleep first in order for that to happen. The crying stops, I check on him and he is full of smiles…another look at perspective–I have a happy healthy baby boy who just doesn’t want to sleep! So, today, I’m still struggling, but I’m keeping it all into perspective. Nothing ever goes as planned and it may be total chaos at times, but I’m grateful for all the blessings we have in our lives.